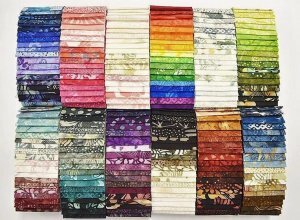 Holiday & January News from Main Street Quilting Co.
Merry Christmas! We know it's been super cold outside, but we've got some hot stuff in the store worth donning the puffy coats for. Lots of new fabrics, new patterns, and a staff of lovely, smiling faces. 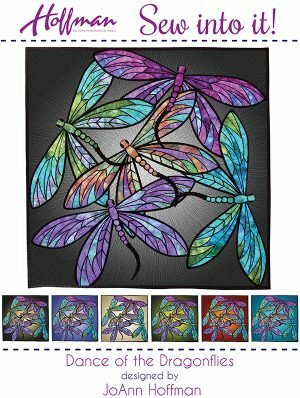 Hoffman recently released a kit in the Sew into It series, a queen sized batik faux paper-pieced quilt. We say faux paper-pieced as there is actually no paper! All the pieces are laser cut for you, and conveniently notched to make sewing easier. 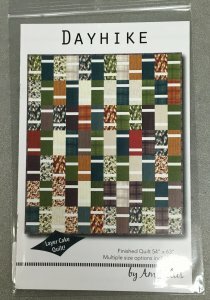 Main St. Quilting will offer a class on this gorgeous kit, so get yours today! Three colors available. Call to let us know which one you want. Kids Club starting Fri, Jan 20, 4pm - 5:45pm- Kiddos from age 6-10 are welcome as we make small projects that can be completed in one or two sessions. Each kiddo will need to bring their own machine and project supplies will be available for purchase at class. Each student must know how to work their machine (and wind a bobbin) and bring basic sewing supplies. Call us for more details. 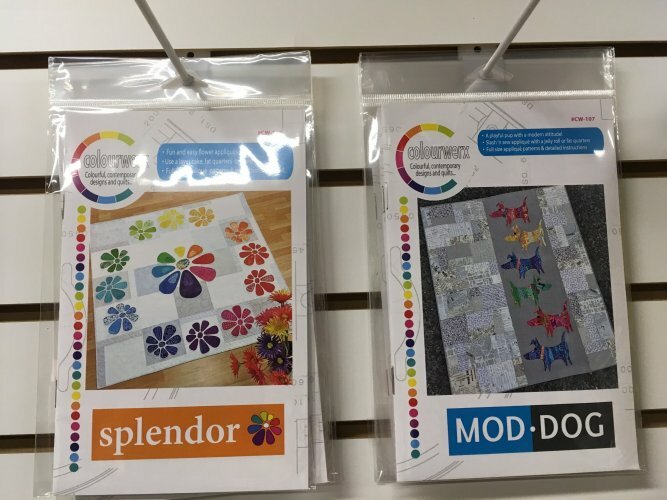 Minkee Quilt as you go- February 3, 10:30a-4:30p Back by popular demand! Please get on the list so we can let you know if that date changes. Didn't see the class you were looking for? Let us know! We are taking suggestions for class topics, including a t-shirt quilt class. Call us with ideas. Help your creative friend or partner accomplish project goals with this fun planner. 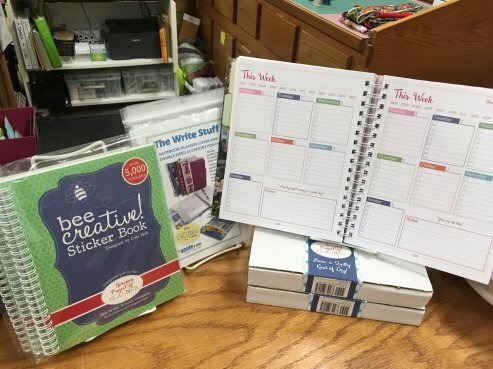 This planner is great as you can jump in and start using it at any time- no need to wait for January first! Use the brainstorming and project planning section to think through ideas before plotting it in the weekly to-do section. Quilt patterns and ideas are in the back section. Also for purchase is a fun, coordinating sticker collection and a pattern for a planner cover. 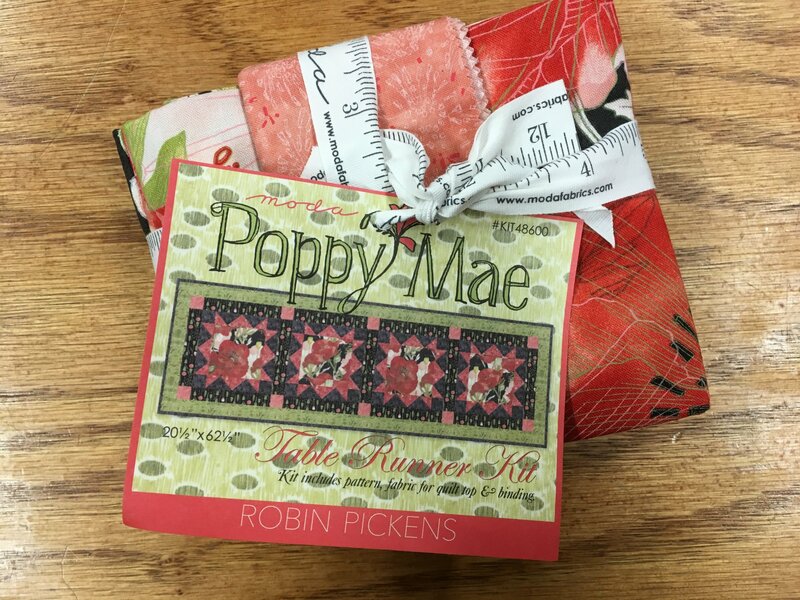 Poppy-Mae: Table Runner Kit and Coordinating Layer Cake- This line has gone fast. We only have a few pieces left! 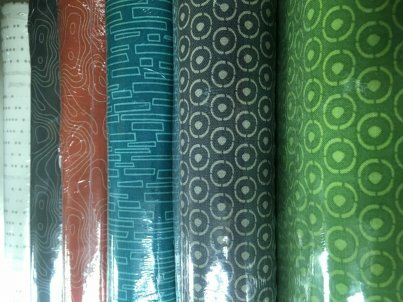 A fat quarter or half yard bundle collection is a huge start towards designing a quilt. 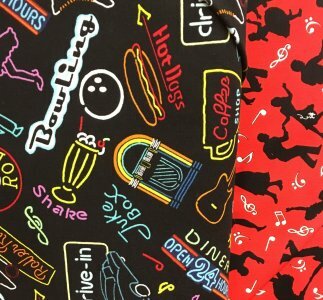 We makes bundles out of many new collections that arrive in store and carry lots of precuts from fabric distributors. 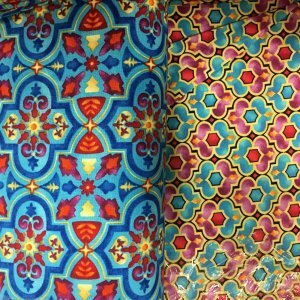 New Kaffe Fassett fabrics are in and bundled! Can't find the bundle of a new collection you're looking for? Ask! 20, 2.5" strips per pack. 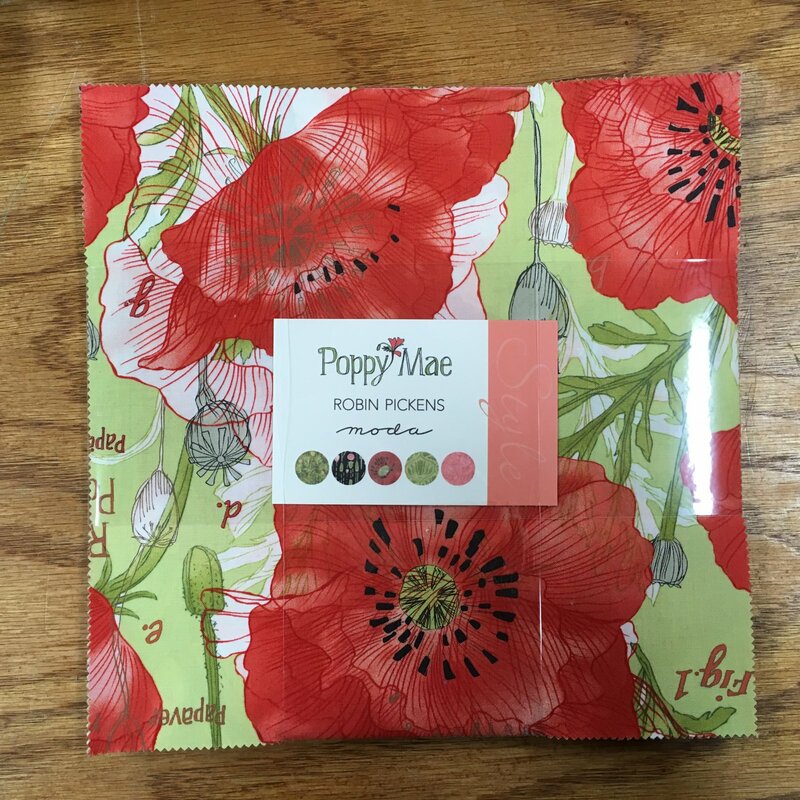 In a wide variety of colors, these poppies make great stocking stuffers! 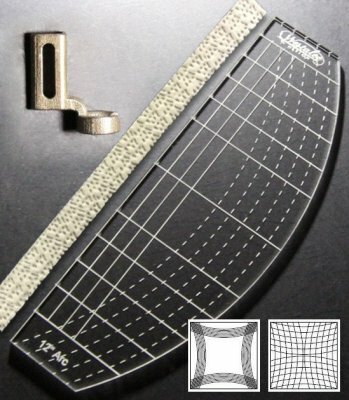 A quilting foot designed for use with quilting rulers such as Sew Steady’s quilting rulers. 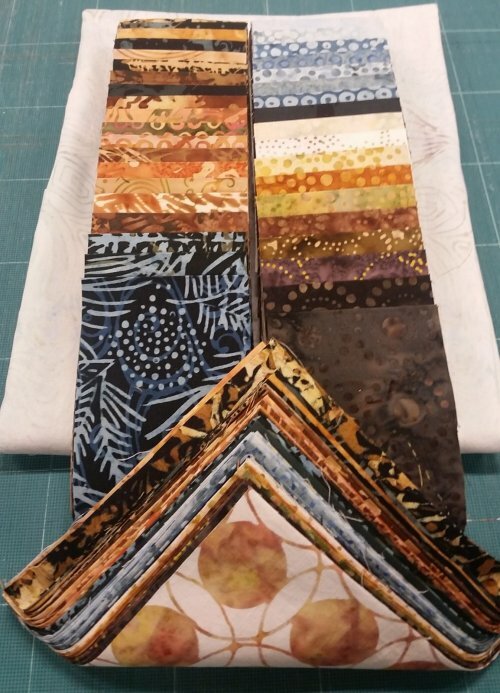 These rulers can be used for all sorts of quilting designs. We have a set of rulers in store for you to look at. A quilting foot is required to use with the rulers. Foot comes with the 12" Arc Template set, but this foot will not fit Bernina shanks. 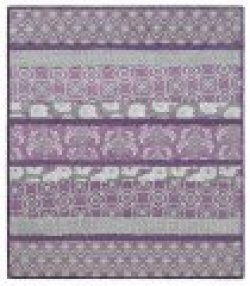 Bernina has just released the #72 foot can be used with these rulers. Call if you want a foot as these will go quick! If you don't want to wait for the Bernina #72 to arrive, we do have a foot adapter that can be purchased right away. We’re excited to announce that starting in December we’re participating in a new distribution system with Hoffman. Every other month we will receive 15, 8-yard bolts of either 885 Dots or 1985 Solids. 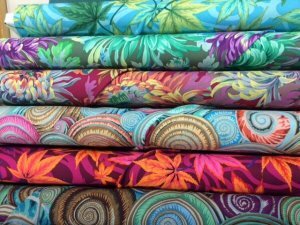 You will for sure want to add these to your batik quilts or simply add the colors to your stash. 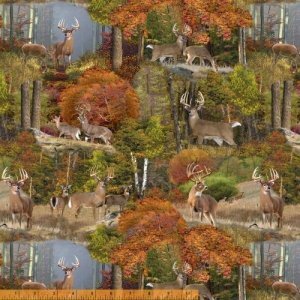 Outdoor collection from Windham Fabrics featuring a digitally printed woodland scene with deer and fall leaves. Beautiful scenes for fussy cutting or featuring as a large block. We’re getting 8 coordinating bolts. 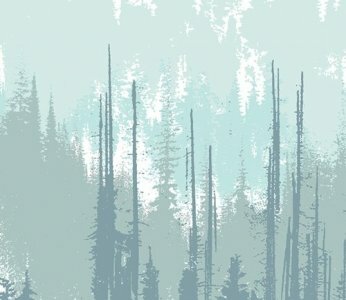 From Art Gallery is an art deco collection inspired by forest lands. 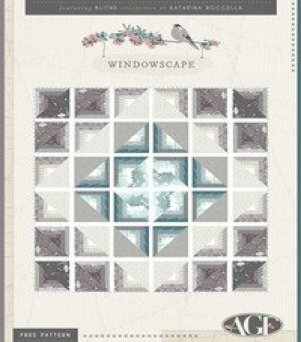 Modern-styled motifs of deer, antlers, birds, flowers, and a forest mingle with icy grey, teal, and cream backgrounds. 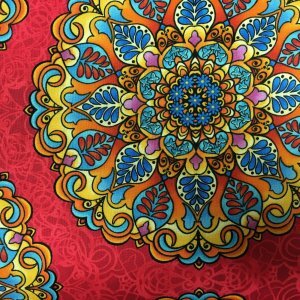 Great prints and colors for apparel or home decor. 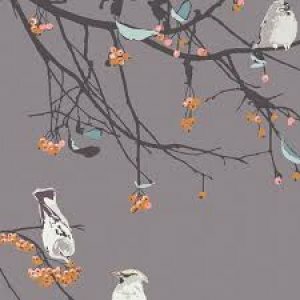 The shop is currently kitting a quilt with this fabric. One teaser image below. We recommend coming to look at it quick as we've sold a few bolts already. Geometrics and bright colors mingle with phrases like “Adventure harder,” “Adventure is calling!” and “Go Explore.” Explore all the fun patterns released with this adventurous geometric line. New colors are in store and more coming. So far we've added new Turquoise, Christmas Green, Christmas Red, Grey, Cherry Red, White. 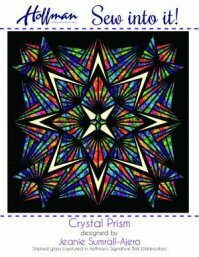 Kaleidoscopes and mosaics shimmer in small and large scale prints. Bold in design and color: bright primary colors and jewel tones. Flannel panel designed for a receiving blanket and coordinating flannels. 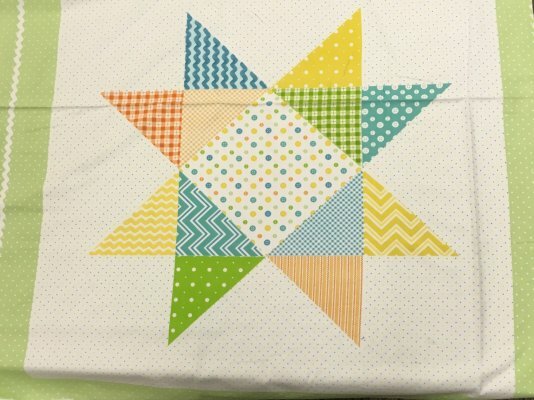 Panel features a printed quilt square design and directions for blanket. Coordinating flannels are polka-dots and a rick-rack print. Artistic and illustrative scenes of outdoor scenes and animals. 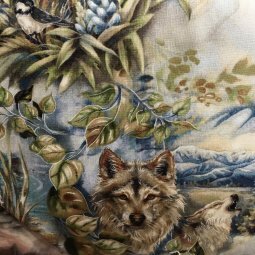 Birds, wolves, otters, and fish. Some bolts are designed as panels, others as yardage. Bowling! Drive-in! Pink Ladies! It’s the 50s! Fun and energetic. If you missed out on the Hoffman Palette Sampler Fabric—think paint swatches—we’ve got one more bolt on the way. Lots of new patterns have just arrived. Come check out the pattern wall. Hoffman Sew into It Kits! Laser cut pieces, notched piecing. Arriving end of January. Quite Contrary has been a very popular quilt kit and now it's coming to you in a new colorway! Let us know if you want one set aside for you. We should have the sample hanging soon. 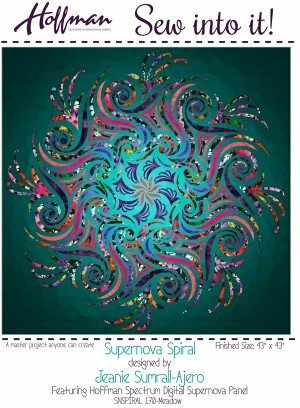 We’re working on Tonga Gypsy, a 108” square quilt and re-designing the colors. This will be a 9 month BOM program in greens, purples, and creams. 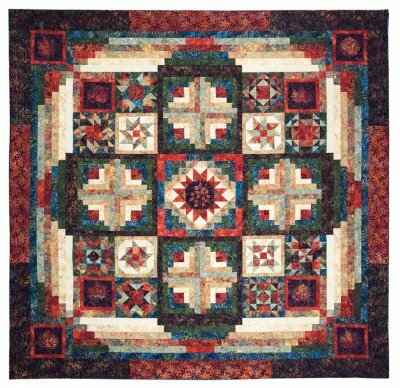 This beautiful 106" log cabin-esque designed quilt features rich jewel tone batiks. Accepting registration now. $36/registration fee. $25.50/month for 12 months The fabrics are so much prettier in person- especially the corner leaf print. You will not want to miss this one! 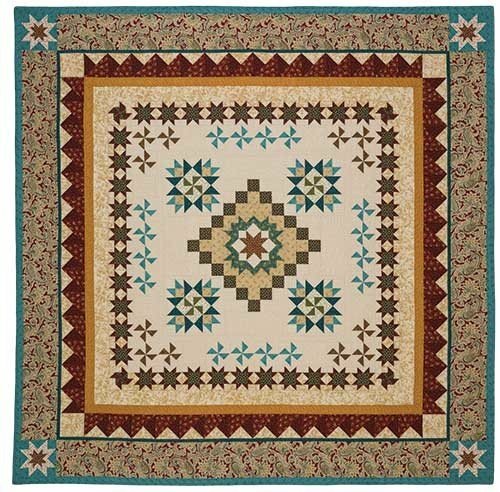 We have a few kits left of this lovely 79" x 79" medallion quilt. Each month's kit comes with the fabrics needed and information on the actress that inspired that block. You must see this one in person- It's gorgeous! Inventory Reduction Sale- It's that time of year where we have to count everything and I'd really rather not- so we are having an after Christmas sale! Monday, Dec 26th for one day only! 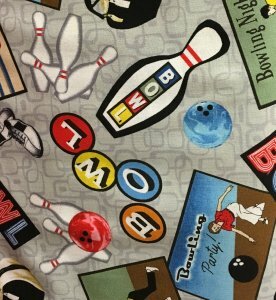 Regular priced fabric on the bolt will be 30% with 1 1/2 or more yards purchased from that bolt. 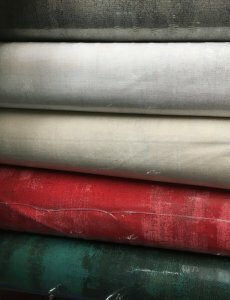 Christmas and sale fabric from our basement will be 50% off. Mettler threads are 30% off. Don't miss out! The latest Arctic Air has us thinking it’s time to hunker down with sewing projects. We repair and maintain all makes and models of sewing machines and sergers. Cameron, our expert technician, comes next on January 6th. His list always fills quickly, so call us today at 406-586-6097 to reserve a slot. We will be closing early on Dec 24 & Dec 31 at 2 pm. We will be closed Dec 25 for Christmas and January 1st.